Desiring an eye-catching piece for display, their website, and their latest brochure, Angelo and John, owners of Concrete Gallery Inc., located just west of Chicago in Franklin Park, Illinois, designed this one-of-a-kind concrete terrazzo vanity. Sure, all terrazzo pieces could be considered one-of-a-kind; however, what make this piece even more extraordinary is that even the curved base is made out of concrete. 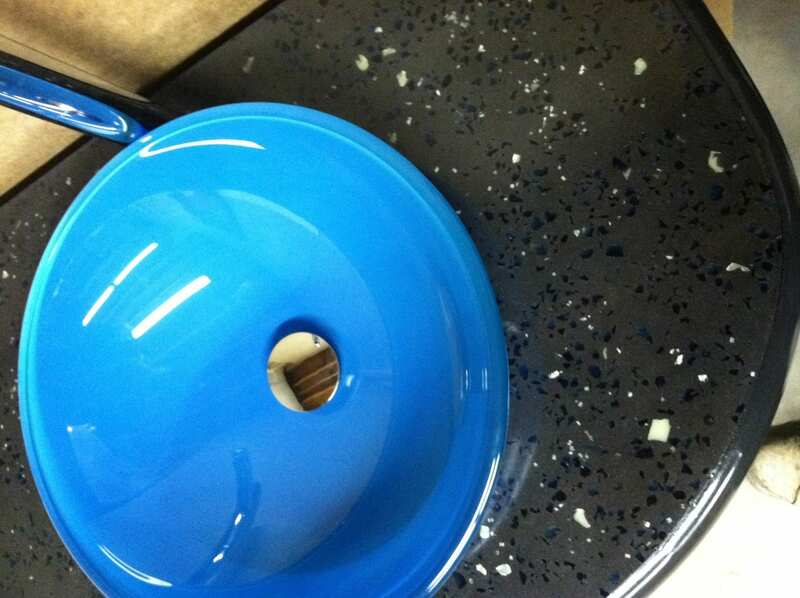 In fact, the only components of this piece that are not concrete terrazzo are the sink, faucet, and the door hinges. With a great deal of determination, this entire project was completed in only 4 days; including the time it took to make the custom molds for the base, doors, and countertop. The base mold was built on a radius so forethought and a bit of finesse went into door molds to accomplish a clean look for the finished product. Concrete Gallery Inc. decided to use SureCrete Design’s Xtreme Series Terrazzo counter top mix to achieve the intense 85% load of recycled aggregates, and have a high early strength, 10,000+ psi, for the concrete terrazzo counter top piece. The base is composed of Xtreme Series Terrazzo Mix and Backer Mix, colored with Charcoal color packs, overlaid with Domino Eco-Stain and sealed with semi-gloss sealer for a subtle shine. The Xtreme Series PreCast Mix was used for the doors and countertop. This Precast Mix is easy to use (add to Pre-Cast Modifier and blend) and up to 20% of the volume being used can be composed of an aggregate. 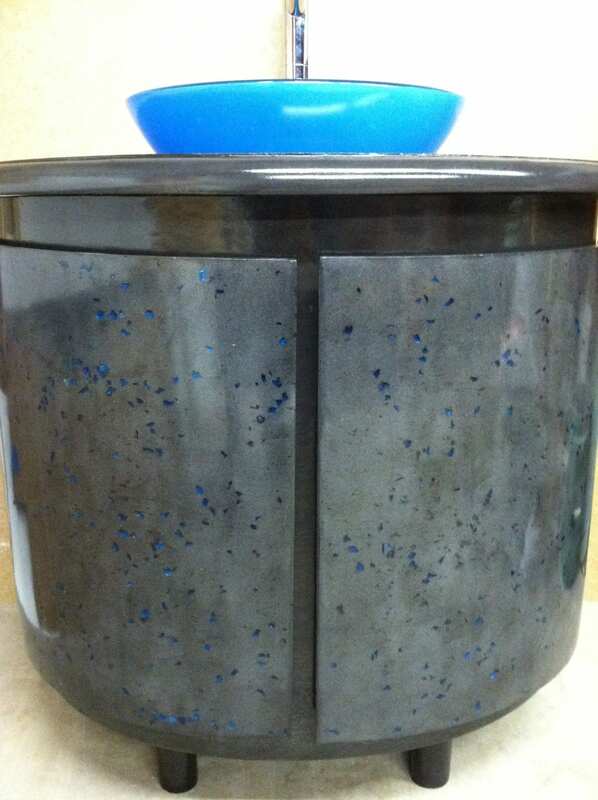 In this case, Angelo and John decided to use blue and black recycled glass along with aqua glow stone in the terrazzo countertop and blue recycled glass in the terrazzo doors. 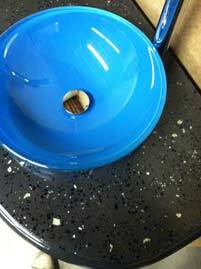 The same color applications and sealer were applied to the terrazzo countertop.